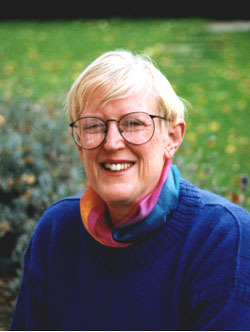 This interview with Margaret Mahy took place in 1994 when she was in Australia for the Children’s Book Council of Australia Conference. This is the full transcript; an edited version was published in Viewpoint: On Books for Young Adults. In your teenage novels, there are the ones with a heavy supernatural element, and the ones, while they do deal with the fantasy life of a character, could be loosely described as more realistic. Do you distinguish between the two, how do choose what novel needs which approach? When I began, I never consciously set out to write a novel for the area that’s called “young adult”, and indeed the categories that we form in these areas are a little bit tricky. The first book that I wrote when I became a full-time author was The Haunting, which I thought of as a book for people of about 11 or 12, and I wrote that quite quickly because I’d thought about that for quite a long time. It was one of a number of stories that had begun as short stories, and which I had put aside until I had quite a lot of time to work on them, and I realised that they were becoming too long and too involved to be short stories. So I wrote The Haunting and I felt very pleased with the story, it wasn’t the sort of traditional story I’d been writing, because quite a lot of the stories I’d written for the short stories and picture book stories were fantasies of one sort or another, and I went on thinking I was going to write The Changeover as another version of The Haunting, well, what I mean is, at the same level. It began like that, and I wrote a certain way into it, bearing in mind the short story that I had originally begun writing, and I was a certain way into the book and I actually thought “this is actually sounding a little bit tedious”. There were two girl characters in the story and I thought it would be more interesting if I changed one of those girl characters into a boy. I did that with the character Sorry, and I found to my surprise, although possibly I shouldn’t have been so surprised, that once I’d done that, because obviously the relationship between the two characters took on quite a different necessity, and it became suddenly very intriguing to me to make them a little bit older and quite bluntly make the relationship a sexual one, or potentially sexual one. I think that the basic idea of the story is not really a fantastic one, in that it is to do with the fact that you take on and incorporate changes and alterations in your life which you then can’t surrender, and you have to live with the responsibility of the alteration you make. As you go through adolescence you make a lot of alterations, you find out things, you get new knowledge, which you can’t pretend not to have. That story (The Changeover) is expressed in terms of the supernatural. The information the girl takes on is in fact a supernatural function which I suppose if you wanted to look beyond that it’s really that she starts to take on the power of the aspects of being a woman, as opposed to being a child. The next story that I wrote was also a supernatural story and it took a long time to write and then I wrote another story which didn’t take nearly as long to write, because again it was a story that I had been thinking of for quite a long time, in a rather different form, and that’s The Catalogue of the Universe. The Catalogue of the Universe is not strictly speaking a fantastic story, it’s a much more realistic story, and in fact that was published ahead of The Tricksters because the publisher said it would be nice to have something that’s perhaps a bit more of a contrast to what you’ve done before. So did that one next, and then The Tricksters was published, and then Memory, which is again its a story with a lot of fairy tale elements in it I think, but of all the stories that I’ve written that would be one that was most intimately based upon elements of my own life, because the time that I was writing it I was looking after my aunt who had lost her memory. The first three books I wrote were all fantasies, the next two were realistic stories, but it’s almost as if, looking back that I wrote through the fantasy as an external presence in the stories, and it became located as an internal presence in the stories, because I think that there are fantastic elements in both The Catalogue of the Universe and in Memory, because Memory really is in many ways, in terms of it’s structure, in terms of its basic events has got a lot to do with fairy stories. And some time after I’d written Memory I thought, well there’s a lot of stories about a young man who sets out into the world without the parents blessing and who encounters an old person or sometimes an animal who asks for help and the way his fate evolves depends upon how he responds to that request for help so its got a very fairy tale structure. At the same time it’s got a lot that’s starkly realistic in it, because I was living with somebody at that time whose response to the world was set free from consensus reality. Well, no because I— well obviously there are people who, adults and a lot of children, who have a very powerful fantasy life, which impinges a lot on what we’d regard as their real life. To write about that sort of character without their fantasy life would in actual fact be to reduce the realism. That sort of vibration, that sort of resonance is part of the reality even though it’s not part of what we’d call stark reality. Somehow or other most of us have some sort of fantasy life and in some people it’s very highly developed. Of course, it’s very unfortunate when that takes over too much and you find that people are living their fantasies in inappropriate ways. But most of us use our fantasies as touchstones by which to interpret the world, even Margaret Thatcher, of course. The fantasies of people like that, they do exist, only often in those cases you don’t choose to regard them as fantasies because the people that they’re operating with — such an enormously pragmatic realism that you don’t associate them with fantasy but the fantasy is still there. What I have done in those later stories, and in Underrunners and in one or two others it becomes very plain where the fantasy leaves off and reality begins, whereas in The Changeover the fantasy flows through. So in terms of setting out to write a book, you don’t distinguish between those genres? I don’t always. There are times when things have become and I haven’t expected them to be, but mostly the story expresses itself, the emphasis of the story seems to go on a particular sort of event. I did write a story called Dangerous Spaces which is a fantasy. I would get the idea for that from the fact that when you look in a stereoscope you’re mind is tricked into establishing space that doesn’t really exist, and I began to think of a story in which the action was played out in that space. So the original idea of Dangerous Spaces came from the contemplation of a certain sort of illusion, a poetic illusion, an imagines space. But with Underrunners I was walking over a piece of land, a peninsula, which it turned out I was actually in the process of buying, and which I now own and we were walking over the land and the man from the Ministry of Forestry that we were walking with said “it’s got very big underrunners”. I’d seen these holes in the ground, some of them quite big, I knew they existed because when people talk about any engineering work in our areas the fact that there’s these tunnels where the ground’s cracked underneath, but not always visible from the surface, the fact that they exist is something that an engineer has got to take into consideration. Of course as I thought about this bit of land which was haunting my mind very much, and which appears also briefly in Dangerous Spaces, as I though about it I thought these underrunners are very significant sorts of things because in a way they’re like metaphors for life which appears one way on the surface and has all these tunnels underneath. So it’s a poetic image but it wasn’t an imaginary bit of land and the space, the tunnel, wasn’t imaginary in this case, so I suppose it might have something to do with the fact that the story seduced what was a realistic story. You were saying that in a number of your books you can’t tell where the fantasy leaves of and real life begins. In a lot of fantasy books the resolution allows you to remove yourself from the fantasy, that the fantasy or the supernatural element is separate from the real world but in your supernatural books there’s no retreat from that element, that the flow between the two is so seamless and you don’t retreat back and say “ok that bit’s over now and this is the real world.” To me that moves the supernatural beyond metaphor, if you like. It might do that. In the stories it’s beyond metaphor. If someone were to ask me how I expected it to work in the everyday world I’d probably say that I did think it would give… I’d probably say it did give the metaphorical way, really, and that it’s some sort of acknowledgment of a part of life that certainly was important to me when I was a child, and to quite a lot of children. It seems to come very natural to children. I’m aware they try out all sorts of things regarding their own identity and the boundaries of the world in terms of all sorts of fantasies. When I was a child, I’ve certainly talked about this a number of times, I had a time when I did maintain that I could speak the language of the animals. Obviously I couldn’t and I knew I couldn’t but I was still very puzzled as to why people didn’t believe me. And why they reacted so strongly to that fantasy? Yes, and why I refused to retreat from it too, and I never ever at any stage said “I was making it up, I can’t speak the language of the animals”. There was a whole lot more to it than that, it became a very elaborate and very heavily defended fantasy. I now think that probably what I didn’t realise successfully and that perhaps other children did realise was that there is a sort of level at which this would work and be appropriate and there’s a level that just doesn’t work at all, and I tried to drag it through into this other level where it didn’t work at all. But you can do that in fiction. Well, you can certainly do it in fiction, and perhaps that’s why I enjoyed stories so. The seamless flow between the two I think is really strong within The Tricksters. I read an interpretation that suggested that the carnival triplets and the whole set of events was basically Harry’s imagination, and yet they impact on the lives of her family as well, physically as well as emotionally. Very early on in The Lion in the Meadow the editor said to me “do you think that the mother saw the lion?” and I said “Yes” and she said, “Oh but that doesn’t make sense, there couldn’t be a lion”. I didn’t know what to say after that. When they first had it illustrated, and then when it was re-illustrated 15 years later, by the same illustrator, in all the pictures the mother is never looking directly at the lion. Now, I’m quite happy to have it that way, in actual fact I think that it’s quite sensible. I think that in actual fact that when I said yes, that I think that the mother did see the lion, and she said that she didn’t see how she could, there was a difference between us, and that my different view of the story was perhaps a perpetuation of the sort of errors that I’d made in childhood. At any rate, in the world of the story, I would say the mother did see the lion, the child’s imagination was so strong that it caused the lion to appear and the mother saw the lion, which the editor wasn’t prepared to countenance. So in the end, I suppose it’s left to the reader to do what they feel is appropriate with that idea, and I’m quite happy about that. There are certain ways in which a writer is entitled to say “this is what the story’s about” but then I think that there are certain ways too when the reader receives the story that the reader is entitled to say “this is what the story’s about”. Naturally, I don’t want to misread any writer, but there are times when I get the story and I read it and this is what it means to me and it’s probably something a little bit different from what the writer originally intended. Also, there’s sometimes things you miss out, or there’s allusions you miss out on, but on the other hand sometimes as a reader you create your own and tuck them in. There has been cases where people have written to me, written about what they’ve received from the stories, I’ve seen one or two interpretations of The Changeover in terms of, say, feminist politics, which was not really my conscious intention in writing it. That doesn’t alter the fact though that you do find — I mean, feminist politics isn’t anything to do with the conscious intention of the folktale, and yet there’s lots of things you can look at the folktale and say, well you know, women are often given passive roles, they’re not exclusively, there’s actually quite a lot of women in the folktale….. Yes, there are, and if you look in Italian fairytales, the Italo Calvino book, he mentions that there was a storyteller who was a female storyteller and she chose stories that featured women. But then there’s also the thing that the heroines are named, and so they’re much more characters than the… I mean, Cinderella is Cinderella, the Prince is just the Prince. He might be called Prince Charming in some versions, but not too often. Or the Sleeping Beauty, you know, a lot of them. There are a few men who are named too, but overwhelmingly it’s women with the names. You don’t necessarily consciously write from the standpoint of certain political whatever, but you’re working perhaps within those frames of reference you’ve read in your own reading or you’re interested in in your own life. Is that just organic, does it all come together in it’s own way? I think it is a bit organic, I think that actually what Calvino says in his very good introduction to Italian Fairytales, is that those sorts of organic tales are often, when they’re about kings and things like that, they’re really the tales of fairly simple people, that they’re tales that dignify the simple and the good, tales of hope in that way. There are quite a number of folk tales with sad endings but a lot of them are tales in which the simple and good person manages to triumph, and they triumph through being good, through being kind. That goes back to Memory. Yes, that’s right. And that represents, I suppose, the hope of a lot of communities, that some sort of goodness and kindness will triumph, even when it simultaneously … I think it’s Eric Hogard in a book called The Little Fishes, that was written a long time ago, it’s a rather sad war story, it sends up saying something like “There the children go and we hope they live happily ever after, but a kind wish is like a shower of rain and brings little relief to the parched earth”, something like that it says. And you get something like John Marsden’s book Letters from the Inside or Cormier’s The Chocolate War, you do get those books that acknowledge that for some people experience is hopeless, but I think the tendency is for a community to produce books, to embrace stories that do reinforce hope. If you’re looking at the oral tradition of the folktale, that is a passing on of that hope. They’re not accounts of the realities of their lives, they’re accounts of the hope that life will end happily for them. And if not for them, then for their children, or their children’s children. And that people will win through to some sort of happy state, and that’s a pretty good hope, and one that’s worth asserting. Most experiences end in a sort of mixed way, and people say, “oh, that story ends by saying they all lived happily ever after, and we know that’s not true”, and they’re right of course. But then on the other hand for a lot of people a sad end to a story isn’t the end either. They live through that sadness and go on to have a mixed life like practically everybody else, so that statistically I think the mixture rather than the assertion of one thing or the other is probably the truest sort of assertion. But it doesn’t alter that every now and then somebody probably does more or less live happily ever after and of course for some people, some sorts of story have very terrible endings which really are endings. I mean in the case of one of the girls in Letters from the Inside one imagines she’s been killed, and that’s why she’s not writing any more. I think that people like John Marsden are quite entitled to write that sort of book. I don’t think they’re entitled to regard it as somehow more real than say a different sort of story, something funnier. I don’t know that you’re entitled to regard the hero of The Chocolate War as any more real than Adrian Mole. Both those things can in individual lives be true. I think that argument is suggesting that there’s only one reality, and also that there’s also only one type of thing that children should be reading. A lot of people seem to feel very strongly that there’s things that kids should read and things that kids shouldn’t read and they don’t acknowledge that like adults kids read across and up and down and all over the place. There’s also a bit of a tendency when people talk about realism, when you read a book where very hard events have occurred, the fairly happy middle class family of the stories of the 1940s and 50s, there are people nowadays who would say “oh, it’s not very realistic, they’re too nice a family”, because our reality has shifted a bit, our literary reality, and has come to encompass the damaged or the fractured family. And of course, most families are damaged or fractured to some degree. They vary a great deal in how destructive they are with their products. Some stagger on and some keep going fairly nicely and others of course fall to pieces. But I think that to speak as if one is more realistic than another… well, there are certain sorts of fashions in realism, and there’s a way of seeing reality as a statistical thing, and I think that’s what you’ve got to be a bit careful about, because it’s not necessarily true. And it’s not treating books as literature, as fictitious expressions. You were just talking about humour. You seem to use perhaps less, or certainly a different kind of humour in your teenage novels than you do in many of your picture books and your fiction for junior readers. For example, I found passages in The Tricksters very funny, but on a very sophisticated level. It was the word games between the family, their relationships were also quite humorous, but not in the uproarious way that some of your other fiction is. I use elements of farce, and slapstick a lot more in stories for little children, and ridiculousness a lot more. Now it’s not that I don’t think ridiculousness has a part in everyday life, and sometimes absolutely going along with tragedy in everyday life. But the form that it takes alters and tends to be something that’s said or perceived rather than event, as in books for little children. I don’t mean that there aren’t ridiculous events but it’s a different sort of event. There’s all sorts of astonishing things. Say in a book like The Three Legged Cat, where the man goes to pick up his hat and picks up the cat, obviously in real life it would be very unlikely to happen, although I got the idea because a friend of mine had a big Russian hat which his step-children had given him and he said that sometimes if he wasn’t looking he’d go to pick it up and he’d find that he was trying to pick up the cat, which was the same colour as this particular hat. I got the idea for the story, and obviously I exaggerated and developed to the point where somebody did pick the cat up and put it on and then I had to centre events around this and it turned out that it suited everybody. Then in books like The Greatest Show Off Earth, you smudge some of those ridiculous events, and those books stand between the two and by the time you get to the y.a. * books the ridiculousness has taken on a more domestic and realistic form, and is often much more subjective and it does express itself in terms of what people have to say about things. But it seems to me to be part of the thing that you have to acknowledge when you’re describing the real world. It’s not extraneous to it, but is part of the texture of realism. The past seems to play an important role in a lot of the books, and the past impacts very actively on the present and the future that the adolescents are moving towards, and the symbol of that is often the ghost, and it’s frequently the ghost of a child. I think that when I was a child from about 10 onwards and I suppose still to the present day, though less than I did in the past I enjoyed reading ghost stories, they give you a very mysterious feeling about the world. I’ve never believed in them except as ways in which the mysteriousness was acknowledged. I do think that there’s all sorts of odd things about time, not just time as a scientific idea, but as the way in which you… when I go into the town I was born in it’s my own ghost that I expect to see, that I feel close to me. I feel that if I could walk out in the twilight sometimes I’d see this child wandering around on the opposite side. I never have, but in a way I suppose by even summoning its presence as a possibility into my mind I acknowledge that it’s there, that one has made some sort of psychic impression upon this landscape. Is that more powerful when it is a child, because of the unnaturalness of a child dying? Yes, and there’s one called “Little Brother, Little Sister” in Grimm’s Fairytales and one or two others. So there’s the fairytale precursors for this. In Dangerous Spaces I think I’m using one or two of those stories, I think I’m using a fairly traditional idea which is the ghost as a presence which hasn’t moved on and dissolved and become part of the universe, but is actually arrested at a certain point and because of this has set up a sort of a distortion. I don’t think that’s an original idea, I think that’s a fairly traditional ghost idea. Say in The Tricksters the past is represented by the triplets and Teddy Carnival’s death which has never fully been explained or resolved, and in the immediate past in Harry’s family there is something that has not been explained or resolved, and so they kind of reflect of each other. And Harry herself can’t take her place in the family and move on until that happens. At one stage someone says to her, I think it’s Oliver, that she has locked them too, her storytelling and imagination has locked them into a sort of mode, where the ghost has separated out into three phases as it were and in the end becomes united again. The death of the child, of the young person, because their lives… I remember once when I was doing philosophy this was talked about, that if somebody died when they were young, you always felt that they died without their potentiality being fulfilled. I suppose that haunts our ideas of most deaths of young people, that they have more that they could have done. Whereas when people are old, you have a much more philosophical feeling about it, even if you are very sad, that they have completed something. The extent to which this is true is sometimes difficult to tell. The image or motif of space, often a physical space, the underrunners, and the space in Dangerous Spaces and Harry’s got her attic, her physical space and is looking for her place in the family, it seems to recur with you. Is it just the nature of adolescence that you’re looking for your own place? No, I don’t think it is just that. I haven’t thought about that very much, partly because nobody’s asked me about it before, but just off the cuff, I think one of the ideas that children explore in a number of ways is the idea of the way in which they fit into space, and there’s ways in which they do this. they write their names, they write their street, they write their town, they write their city, they write, I remember having great huge long addresses; the solar system, and all that sort of thing. But also they make little spaces for themselves. They make little play houses. I think it’s Sally’s Secret, Shirley Hughes, where a little girl makes houses for herself, but there’s a lot of stories — clubhouses, places like that, children make specific spaces for themselves. I think it’s a very human and a very important thing to do. People at the CBC Conference talked a lot about the question of privacy and children needing their privacy, I guess this is part of it too. It is to do with privacy. I think that once you make a space your own, no matter how humble it is, or the moment you create a space that’s just a really important human activity and there’s all sorts of ways in which this can be acknowledged. I’ve been writing a book where a child does something I used to do when I was a child. We had a lot of trees in our yard and I used to climb one tree and work my way, because they were close together, right along this line of trees. I could go along on that level and see bird’s nests and things like that, and that was a very significant space to me when I was a child. It was up above the world. I’ve written another story about a child climbing a tree called “The Highest Tray Cloth in the World”. It’s in a collection somewhere. It’s written out of the memory of doing all this tree climbing. We used to make houses, there’s a lot of children who have tree houses. Ideas of spaces of that kind have no beginning and no end, and I’m sure that they flow on into the ways that people interpret their homes. Peter Pan and Wendy, they had a tree house, didn’t they. Yes, I think you do, and what strikes me is often the fallibility of the parents, and part of the resolution of the story is often the child coming to understand and forgive the parent for some sort of failing. In The Tricksters, there’s the father’s infidelity, and Dido’s “mistruths” in The Catalogue of the Universe. Well, I think that that’s fairly true, I think that because young people growing up have a pure and sometimes simple view of the world they don’t think of their own fallibility, and they haven’t had as much time to be fallible. They’re more ruthless about their parents failings. And so of course, being a parent implies that you’re going to have to try that much harder to be perfect because you’ve got to try and do better on somebody else’s behalf as well as your own. It’s not that I think adolescents aren’t highly fallible too, but one of the great encounters of growing up is an awareness of your parent as a human being and not just as a parent. So it becomes quite hard when you’re growing up suddenly to look at your mother or your father and think that they are a man and a woman, and not just that they’re your parents and that that’s been the apotheosis of their lives, to be your parents. Their lives are going to go on, and going to go on in different ways, and of course it’s just as well, because somehow or other a lot of children go away. I think one of the great problems for women in the past was they were encouraged to invest so much of their identity in their children that when their children left home, quite a number of them actually had nothing they could go on to. Until they had grandchildren. And even then they might sometimes want to take them over and all sorts of things. On the other hand, if you’re a busy career grandmother, it’s hard to find time to look after your grandchildren, and that’s a quite important thing to do, too. In your books there is often an almost irresistible attraction to death that the characters have to struggle against, and I think that’s very true for Anthea (Dangerous Spaces). I think that’s a theme that comes a bit in Underrunners, it’s certainly comes in quite strongly in Dangerous Spaces, I think that that’s true. I think that quite a lot of adolescents become rather fascinated suddenly with their own mortality, and they are fascinated by it without quite believing in it, which is probably one of the reasons we get quite a lot of teenage suicides. They test themselves against this ultimate reality. I don’t really want to encourage anyone to do that, but it is part of our imaginative apprehension of the world. There’s a story, I haven’t written this book yet, and may never write it, but it certainly plays quite an important part, because at the end of the story which I envisage writing one day, the hero is a young man who is very much in love with a beautiful girl, and she tells him towards the end that she works in a funeral parlour, and that during the day she’s been laying out somebody that he knows. We all have this very peculiar attitude to… this actually causes him to slip back in every sense of the word. It’s a bit of a test that she’s put him through, so that when he says, “it doesn’t matter”, she says “too late!” It’s an interesting thing. *Interesting also how back in 1994, ‘YA’ clearly wasn’t in currency!